Mac OS has the best quality in apps. Take my word for it, it just does. Today I will present you the best five apps for 2017. More will follow later on. Originally stumbled on this little gem on Beautiful Pixels couple of years back. The idea of the app is dead simple countdown, but the user interface is most intuitive I have ever seen. Just drag and drop, add a reason if you want. Gestimer costs a couple of bucks, but is totally worth it. When in doubt, use Gestimer. I use it for heating food or reminding myself with anything. Ever having to plug your computer to a big screen in a meeting or presentation? then Pliim is for you. Pliim is a very minimal app that only does what it needs to – hides stuff from curious eyes. 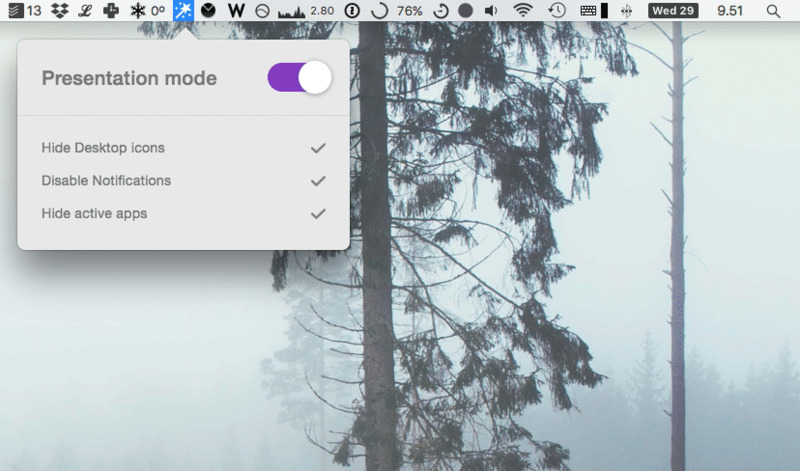 Hide Desktop icons, disable notifications and hide active apps with this little app. If you are a minimalist like me, you like to keep your desktop clean. Screenshots on Mac go to desktop by default so it gets very cluttered if not cleaned up daily. 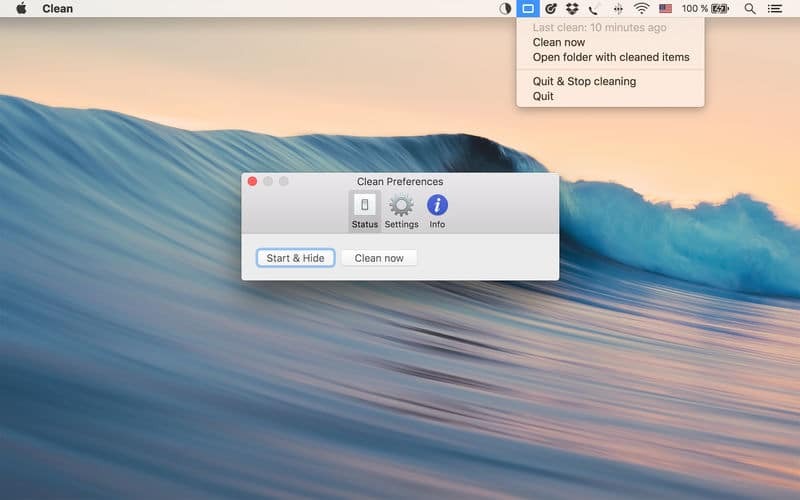 Clean does the work for you and moves all files from desktop once a day to ~/Documents/Desktop where the files are sorted by month. Sometimes when on computer, you may need to calculate how much time is passed. 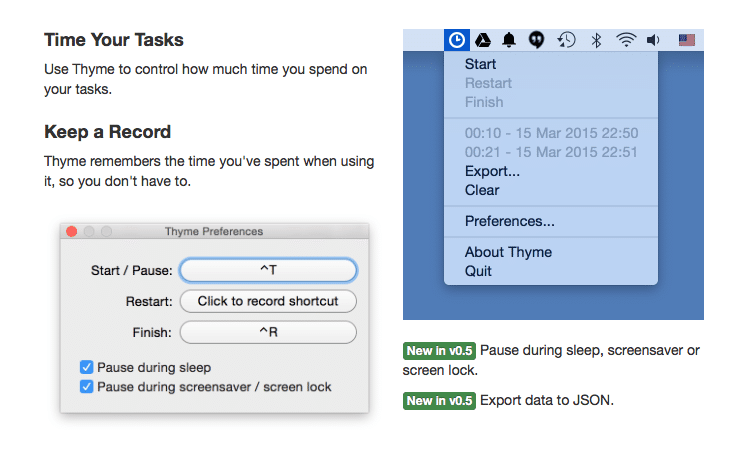 I have used Thyme for example to keep track on how much times take, for example getting my kids to sleep, or other useless stats, but you can use this for almost anything. Thyme does nothing more than calculates and stores the passing time. This is like opposite to Gestimer presented before. Simplenote is perhaps my most used app. It’s just very simple note taking app. 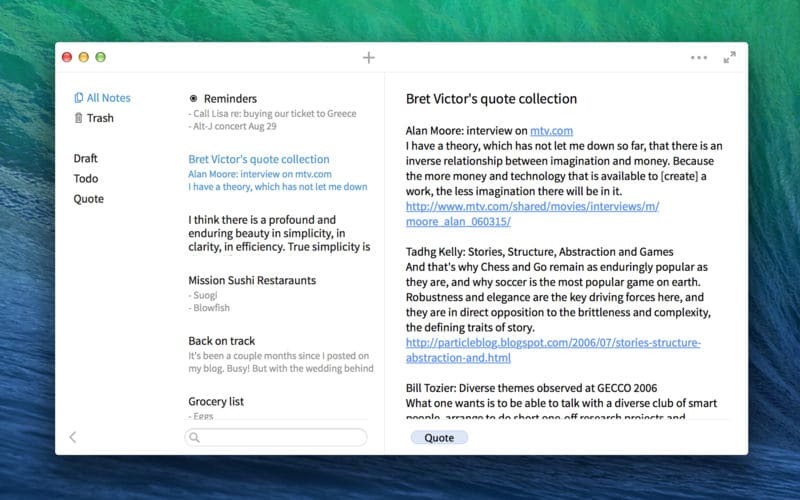 As a minimalist I dislike abominations like Evernote, so Simplenote is perfect for me. Unfortunately Mac version does not support Markdown (yet), but I see I don’t usually need it. I use Simplenote for any quick notes and it’s great it stores every word in real time and I can search my thoughts later on. Tagging is also quite useful feature. Simplenote is available on every platform and device (iOS, Android, Mac, Windows and Linux, web browser). I use a lot of apps and would love to present you more of them. The feedback inspires me to write more, so make sure you tell me if want to see more posts like these! Next I could write about apps I’m willing to pay for… or something else? The first one listed, Gestimer, (even if is worth the price) is not free at all. Oh right… have been using Gestimer for so long didn’t realize it wasn’t free. But the rest four are. Sorry, my bad. Fixed the heading. Thanks for noticing, Pictor!